Never Bet Against Occam: The Chronic Illness Connection? 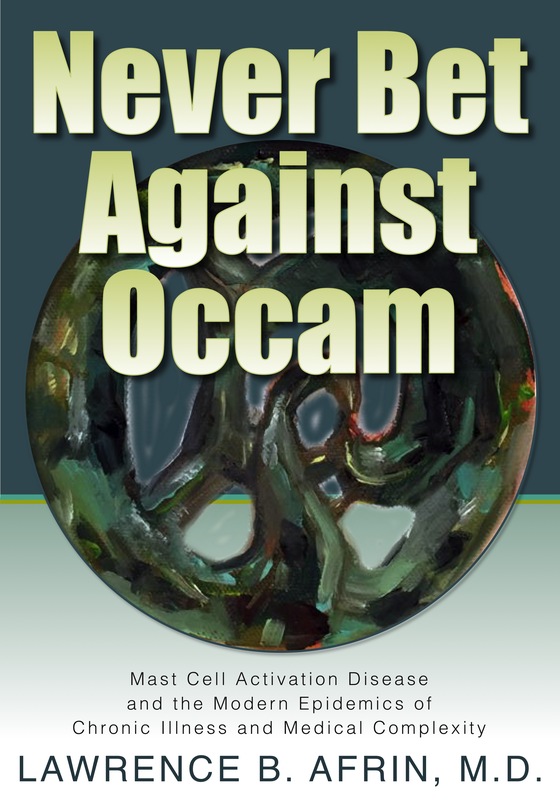 Sisters Media, LLC announces the release of Never Bet Against Occam: Mast Cell Activation Disease and The Modern Epidemics of Chronic Illness and Medical Complexity by Dr. Lawrence Afrin. What if there were a disease that could affect every system in the body? 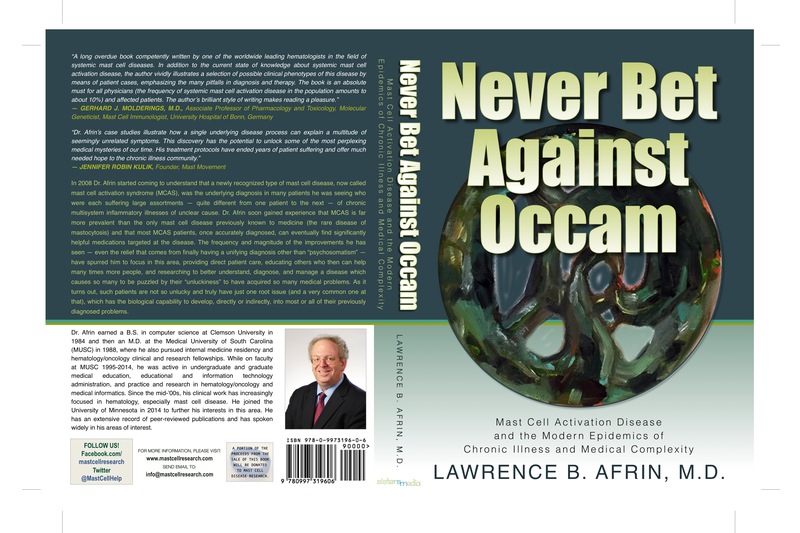 Sisters Media, LLC announces the release of Never Bet Against Occam: Mast Cell Activation Disease and The Modern Epidemics of Chronic Illness and Medical Complexity by Dr. Lawrence B. Afrin. What if there were a disease that could affect every system in the body? A disease that may be at the root of many other common diseases? How can a physician recognize a disease that can present with virtually any symptom, a vast array of physical exam findings, and requires esoteric lab testing for confirmation of diagnosis? In his book, Dr. Afrin takes the reader along on his journey of discovery as he investigates his patients’ complex medical histories and starts to see startling similarities. Could misbehaving mast cells be the common factor? Afrin’s informal journalistic writing style gives the reader an intimate glimpse into a physician’s mind. How do physicians tackle the most medically complex patients? The patients that have been labeled as unfixable, medical zebras, over diagnosed, chronically ill, or even mentally ill.
With over 57 five star reviews in the short time since its release, Never Bet Against Occam is resonating with hundreds of people, and momentum in the medical community has only begun! Nearly half of all Americans suffer from a chronic illness. Almost one-third of the U.S. population is living with multiple chronic illnesses. Nearly 50 million Americans suffer from autoimmune diseases. Diagnosis and treatment of multiple chronic illnesses is complicated due to the specialization of doctors and their general lack of awareness of the interrelationships of multiple disease processes and their treatment. During his 25-year career as a hematologist, Dr. Afrin slowly became aware of a subset of chronically ill patients that were not responding to treatment and reported many symptoms that did not fit within the parameters of their diagnoses. Were these patients so "unlucky" to have acquired so many medical problems? Afrin forced himself to step out of the confines of hematology and look at the whole patient. Through detailed patient histories and countless tests, the pieces of the puzzle emerged. Many of the complex patients he saw exhibited signs of aberrant mast cell behavior and were then proven to have Mast Cell Activation Disease. While MCAD certainly isn’t the answer to all complex mystery illness, it is turning out to be much more common than mast cell disease was previously thought to be. Mast cells mediate allergic and inflammatory response and play a vital role in our body’s defense against invaders. These cells contain over 200 chemicals, or mediators, that can be released in response to an allergen or to protect us against a parasite or germ. Mast cells may be involved in conditions such as food allergies, allergies to bug bites, celiac disease, Interstitial Cystitis (IC), heritable connective tissue disorders, such as Ehlers-Danlos syndrome (EDS), and more. In Mast Cell Activation Disease (MCAD), mast cells begin to malfunction. Similarly, Mast Cell Activation Syndrome (MCAS) features inappropriate mast cell activation with little to no increase in the numbers of mast cells, while Mastocytosis features inappropriate mast cell activation and a significant increase in the number of mast cells. MCAS and Mastocytosis fall under the MCAD umbrella; the terms “mast cell disease” and “mast cell disorder” are used interchangeably. In MCAS, a patient’s mast cells become ‘dysfunctional’ and begin inappropriately releasing some or all of their mediators, even in the absence of normal triggers. Additionally, some MCAS patients’ mast cells can be triggered by many hard-to-avoid stimuli such as food, medicine, infection, allergens, chemical exposure, heat/cold, or even emotions and stress. The release of these mediators leads to a chronic, multi-system and inflammatory themed disorder that can wax and wane over time. Dr. Afrin discovered that if he treated this aberrant mast cell behavior, many patients improved. Dr. Afrin earned a B.S. in computer science from Clemson University in 1984 and then an M.D. at the Medical University of South Carolina (MUSC) in 1988, where he also pursued internal medicine residency and hematology/oncology clinical and research fellowships. Since the mid-’00s, his clinical work has increasingly focused in hematology, especially mast cell disease. 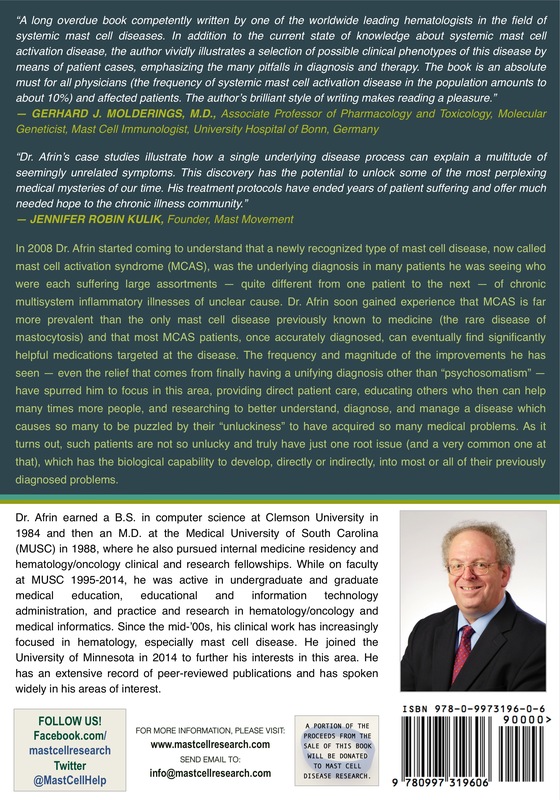 In 2008 Dr. Afrin started coming to understand that a newly recognized type of mast cell disease, now called mast cell activation syndrome (MCAS), was the underlying diagnosis in many patients he was seeing who were each suffering large assortments — quite different from one patient to the next — of chronic multisystem inflammatory illnesses of unclear cause. He joined the University of Minnesota in 2014 to further his interests in this area. He has an extensive record of peer-reviewed publications and has spoken widely in his areas of interest. Never Bet Against Occam: Mast Cell Activation Disease and The Modern Epidemics of Chronic Illness and Medical Complexity is available in both paperback and hardcover print, and digital/eBook via Amazon (http://amzn.to/1sggzKv), Barnes & Noble (http://www.barnesandnoble.com/w/never-bet-against-occam-lawrence-b-afrin-md/1123579320?ean=9780997319613), and other online retailers, such as iTunes. Follow @MastCellHelp for the last information on Dr. Afrin’s widely popular book, and links to additional publications on mast cell research and Mast Cell Activation Disorders. Questions and press inquiries can be sent to - info(at)mastcellresearch(dot)com. Sisters Media, LLC is a media company focused on the publishing of digital and print materials in the fields of health, medical and wellness, including non-fiction books, anthologies, and magazines, as well as on photography and design projects.